from Tamasin’s Kitchen Bible, p.169. Tamasin Day-Lewis belongs to a generation of British cookbook writers that includes very prominently Nigel Slater. Like Nigel, Tamasin writes recipes in a breezy, offhand chatty style, although her recipes comes with a list precisely measured or weighed ingredients and Nigel’s do not. I have one other book of hers, The Art of the Tart, which I grew so fond of that I decided to pick up another of her books when I passed through London in September. She has recently published a big compendium of 1,000 recipes, All You Can Eat, but I decided to take her earlier book mainly on the ground that the new one is in hardcover and expensive and Tamasin’s Kitchen Bible (TKB, from here on out) was in paper and slightly cheaper. Apart from the cookbook’s organization, I like the cookbook and the attitude of its author. In particular, this lambshank recipe struck me as sensible and promising. I’ve made this recipe twice now, although I have not yet eaten the second batch. It’s flexible, pretty straightforward, and the first version was delicious. Put the flour and seasoning in a re-sealable platic bag. Throw in the shanks, seal the bag and give the shanks a good shake to coat them in the seasoned flour. (That way you don’t end up wearing it.) Shake off the excess flour and remove the meat. Heat the oil in a large, heavy-bottomed casserole and brown the shanks on all side over a medium heat. This should be done quickly, a couple of minutes a side until they begin to brown and crust. Scrape up any burnt bits of flour from the bottom of the pan and remove with a slotted spoon. If the pan looks like it needs more oil, add it. Then throw in the rosemary and let them fizz and hiss for a minute. This begins to tenderise them and draw out their astringent scent. Add the thyme, onions and garlic, stir and cook until softened and beginning to turn translucent. Raise the heat and add the wine and vinegar together, bubbling them furiously for a couple of minutes. Return the shanks and their juice to the pot, lower the heat and add the bouquet tucked into the side and cover the pot with a layer of greaseproof paper and the lid. Simmer very gently for 2-2 1/2 hours, turning the shanks in the chocolate-brown liquor every so often. You may add a little more wine if it looks like the sauce is reducing too much. 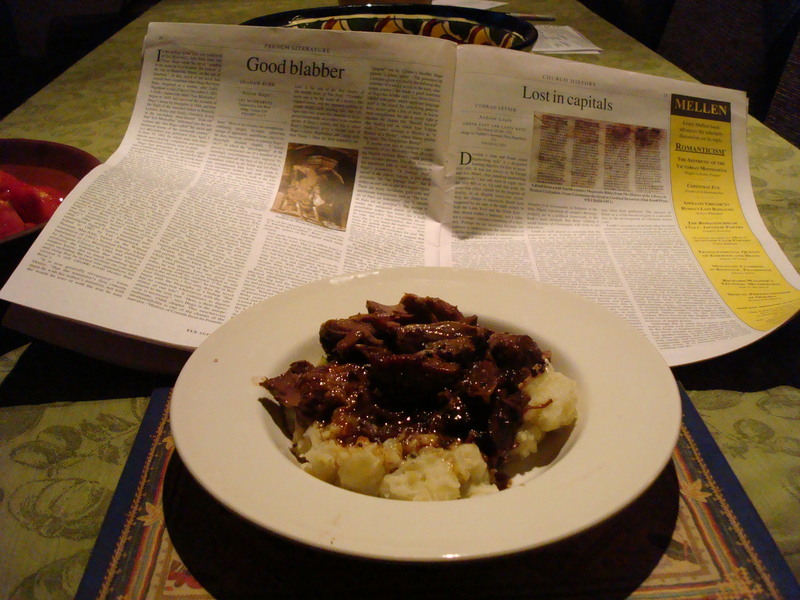 Serve with champ, a wonderful Irish dish of mashed potato. The first time I made this I was in a hurry and didn’t prepare all the ingredients before I began. Mistake. I needed to focus my attention on the heat of the oil in which the shanks browned and the minced herbs, garlic, and onion subsequently sauteed. When she calls for medium heat, heed that call. The second time, the transition from browning the meat to sauteeing the herbs without burning the latter went much smoother because I kept the flame to medium and kept my eye on the pan. Next, the sauce. I jiggled the proportions of wine to balsamic vinegar from the first attempt to the second. The consistency of the sauce was thick, the first time I made it, thanks to the flour on the meat and the balsamic, I believe. The second time, I increased the amount of wine to 12 oz and decreased the vinegar to a little more than 2 oz. The sauce was thinner, but not as sweet as the first, which was what I hoped would happen. I used two shanks in the first version. It took barely two hours to fall off the bone. The second time I used two shanks and a small rib-in shoulder roast and it took almost 3 hours. One last change: in the second version I stuck it in the oven at 325 for 2 hours to braise. But I took it out and let it simmer on the stovetop for another half hour or so more. I mashed a potato with a little butter and milk to eat with it. I’ll update this on Wednesday after my guests and I eat the second version. UPDATE Wed Oct 15: To judge from my friends’ responses, the meal was a success. I braised a shoulder roast and two shanks, having adjusted the white wine-balsamic as I noted above. I think the next time I make this — and I’m sure to do it again — I’ll go back to the original proportions and give it one more try. But this makes a good autumnal and winter meal. I feel much encouraged to try other recipes in Tamasin’s book. Do you think I could do this in the slow cooker? Yes, but only after you’ve browned it. I’d put it on high for 5 hours.